A recent donation of A.E. 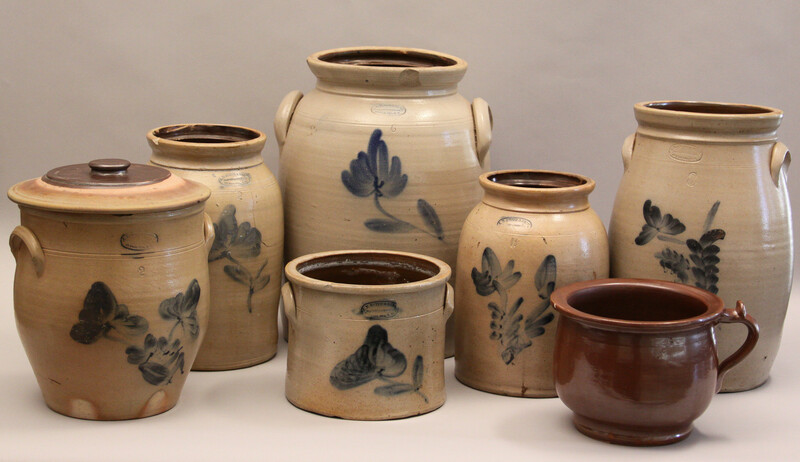 Smith & Sons stoneware by collector Ralph C. Bloom has added seven new pieces to Historic New England’s collection of Norwalk pottery, made by Asa Smith and his descendants. The only previous example was a stoneware birdhouse donated in 1932 by Asa Smith’s granddaughter, Elinor. As the official city historian of Norwalk, Mr. Bloom has long been interested in the history of the city and its potteries. While curator at the Lockwood House Museum, he updated and edited the Andrew L. and Kate Barber Winton article about the five different potteries that operated in Norwalk at various times between 1780-1887. Mr. Bloom collected the stoneware over a period of forty years. Some of the pieces were gifts to him and others were purchased by him at auction or from other collectors. Two of the pieces were acquired from the ruins of the largest Greek Revival House in Norwalk, Connecticut. Asa E. Smith (1798-1880) founded the Smith pottery, later the Smith & Day pottery, A.E. Smith & Sons, and A.E. Smith’s Sons’ Pottery Co., in 1825. The pottery crafted and sold jars, jugs, plates, and pitchers until it became insolvent in 1887. In 1888 the pottery was sold to the Norwalk Pottery Company. All of the stoneware jars and churns are stamped “A.E. Smith & Sons, Manufacturers, 38 Peck Slip, N.Y.” This mark was used by the pottery from 1855-1874. Though the factory was located in Norwalk, Connecticut, all of the finished products were stored at the company warehouse at 38 Peck Slip, New York, before being shipped to various customers all over the United States.